Duvetyne (or duvateen) | Commando Cloth has long been an industry essential for blocking out light during film, stage and photography production jobs. Duvetyne fabric, which is also called commando cloth, is made from a matte twill fabric and features a velvety nap on one side to assist in light-blocking applications without damaging your equipment. It may also be used to make solid flags and butterflies and, when fire-retardant, may be used as curtains for blocking out natural light. BarnDoor Lighting Outfitters has a great variety of black duvetyne by the roll for easy transport. Choose from lighter weight 12-ounce duvetyne or heavy-duty 16-ounce duvetyne from our selection. These flame-resistant duvetyne rolls are packaged in a convenient size (15-inch by 12-inch by 3-inch) for compact, easy transport and storage. 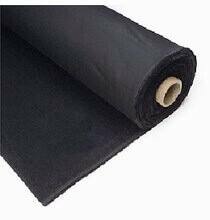 Also check out our pre-packaged bobbinet black net fabric, that’s sealed in a soil- and damp-resistant 5-mil plastic bag. Have questions about which duvetyne product is right for you? Reach out to us by phone at 1-888-276-3667 or by e-mail at info@barndoorlighting.com.